This system is used by organizations to identify, authorize and grant access to employee vehicles inside company premises. 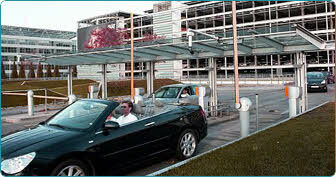 It is also being used at Airports, Toll-gates, Car Rentals and Warehouses for long range vehicle identification. 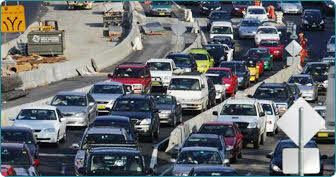 The Active RFID technology used identifies a vehicle at a distance of up to 10 meters and speeds of up to 200 Km/hr. The system is highly reliable in all weather conditions and is robust. The system has a scalability to not only identify the vehicle but also the driver. The controller integrated within the active RFID Nedap Transit reader facilitates offline authorization and controls. This innovative solution provides complete business systems comprising both hardware and software to help you identify, track and manage your vehicles, everywhere in the world. We offer individual or combined RFID and GPS solutions to ensure security and visibility for your company. The numerous performances of identifiers and readers provide a wide choice of applications for vehicle identification: parking lot access control system for static or moving vehicles (free-flow), automated systems of vehicle authorization, fleet management, etc. Range of readers and identifiers enables you to secure your accesses and checkpoints through an automatic free-flow identification. Moreover thanks to vehicle contactless identification you are able to put in place the management of your fleets. Online supports a range of tracking and monitoring hardware that is attached to the customer’s asset. The tracking hardware is configured to send message reports back to online data server. These messages contain information such as the assets latitude/longitude, speed, heading and status. The backend server stores and processes this information, monitoring for any alarms or incidences that may have eventuated. Depending on where the asset is or what events have happened the system may automatically dispense alarm notifications to users in conjunction with compiling reports and visual indicators made available through the web interface. Know the location of all your vehicles/assets at the same time With the movement of multiple vehicles across large areas it is important to know their location. Online incorporates an intelligent fleet mapping system that allows you to monitor and visually locate the individual location of each vehicle/asset within your fleet simultaneously. By utilizing advanced clustering and maps supporting more than 15+ levels of zoom users can see one or all their assets/vehicles simultaneously. In addition users can break fleets up into small groups and assign different users to monitor the subgroups to ensure that all assets/vehicles are under constant supervision no matter the time zone or location. There are many points of failure within a vehicle and its associated equipment. By incorporating intelligent tracking hardware that can electronically monitor the status of components within the vehicle. Online can monitor these variables and alert users when components fail. This allows users to monitor when rear doors are open/closed, ignition on/off, trailer attachments, etc and ensure that users of Online know the status of these events as they happen. Keeping track of each vehicle/asset with a fleet and its different activities can become a real challenge. Online provides users with access to detailed reports comprised of their activities and alarms. Users can monitor speeding, arrival/departure times, excess braking/acceleration and other information sourced from either the vehicle or its travels. These reports can be generated based on a single vehicle or collated for the entire fleet to give users a complete understanding on their activities. This supports an extensive range of features and benefits to assist in the tracking and management of assets. Supporting a hierarchical fleet management structure with features such as alarm/alert management, geofencing and remote polling, Online is a state of the art, highly advanced system. It has been engineered from the ground up to ensure that users have the performance and features required to monitor and manage fleets of all sizes effectively. The secure web portal allows access to view street level maps, satellite imagery or a hybrid view to easily pinpoint locations and points of incidence. In any of the above examples, when an alarm happens Online has multiple ways of generating alerts. Users may be alarmed via email/SMS notification, visually within the online interface or in addition the system can also send out special commands to the tracking hardware located within the vehicles/assets that activate digital I/O’s to trigger sirens or warning lights and ensure that people notice. IThis supports an extensive range of features and benefits to assist in the tracking and management of assets. Supporting a hierarchical fleet management structure with features such as alarm/alert management, geo fencing and remote polling, Online is a state of the art, highly advanced system. It has been engineered from the ground up to ensure that users have the performance and features required to monitor and manage fleets of all sizes effectively. The secure web portal allows access to view street level maps, satellite imagery or a hybrid view to easily pinpoint locations and points of incidence.